In November, Alice Harper taught me to gift wrap our large display of “Evening in Paris” perfume and cologne products. She insisted perfection in the results and we first did about a half-dozen “dummy displays” using empty boxes from the pharmacy but really beautiful gift “samples” for display. The “For My One and Only” combination looked beautiful. The doctor said, “Put them on my account and have Billy put the big box in my med supplies closet behind my desk upstairs.” I understood because all his patients were very attractive ladies. Alice called the warehouse the next day–the doctor might need more! 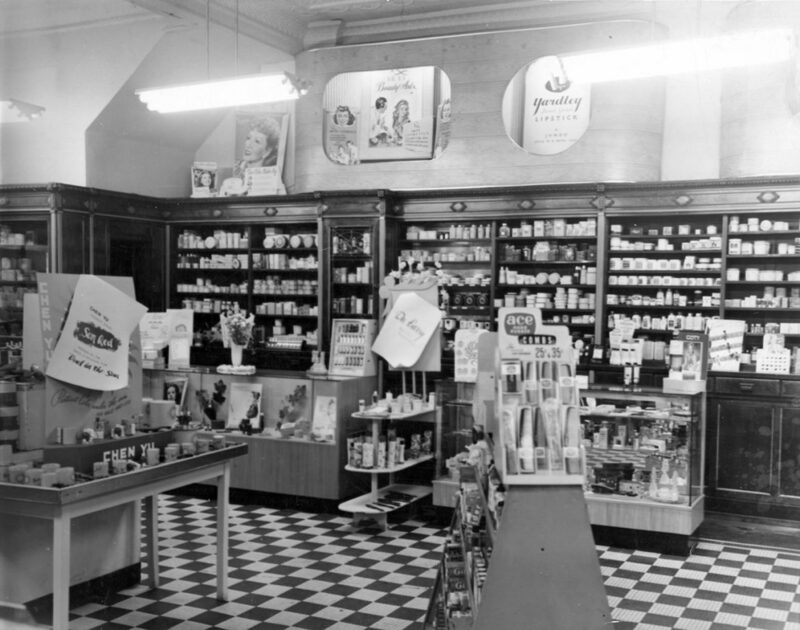 Undated photo of Harper’s Pharmacy interior. Courtesy of Alice Harper and Mary Harper Hall. 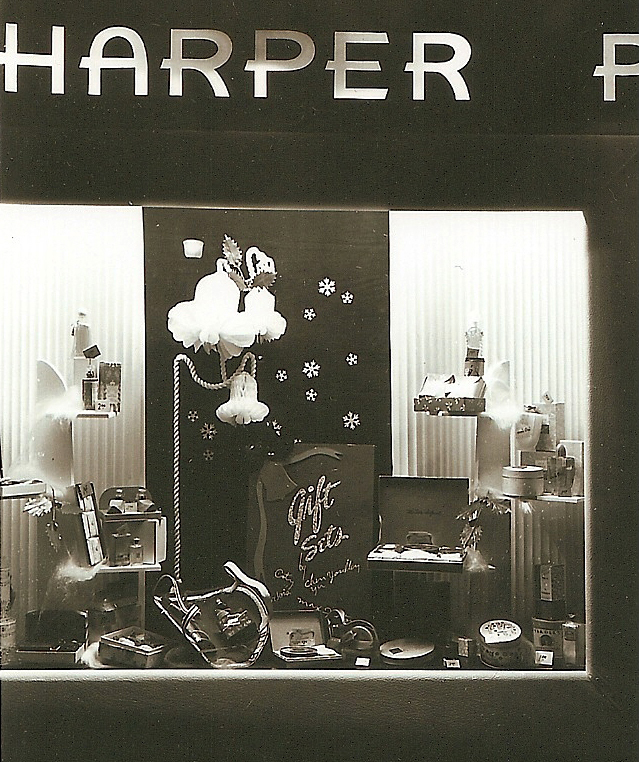 Undated photo of Harper’s Pharmacy exterior display window. Courtesy of Alice Harper and Mary Harper Hall. 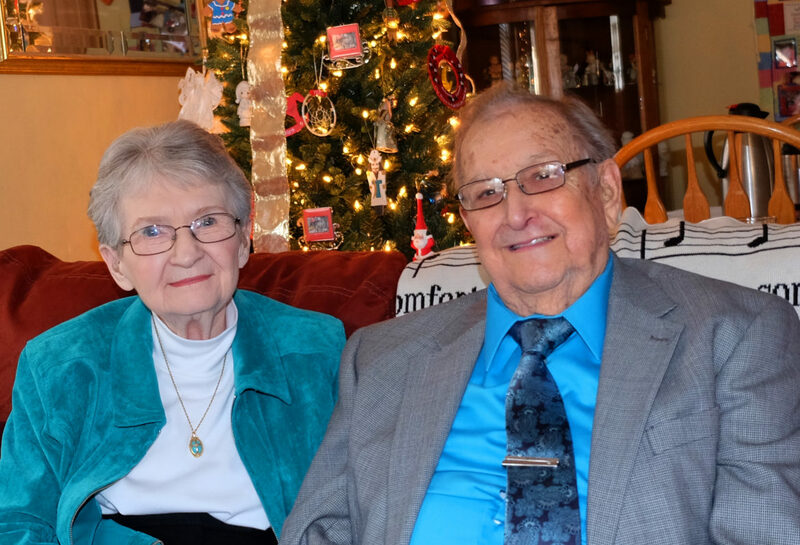 Our chief benefactors of mid-20th century Maplewood stories, Barbara and Bill Jones. Much thanks to you both. looking at the pictures again I can understand your anger/disgust/dismay (you can tell us how you really feel) at the tearing out of the interior of that place. What a great looking place. I hope some of it will survive and be used somewhere else. Well some of the cabinets have been used elsewhere, Mark but that is another part of the issue. The cabinets could have been sold. I talked to folks in and out of Maplewood that wanted to use them in their business. Salvaging the cabinets misses the point. My position was and still is that they should have been retained in their original location. This could have happened, I’m convinced, if not for the incredibly stupid decision of the management of the Sierra Club chapter that now occupies that spot. Those cabinets were/are one of the treasures of our historic fabric. They were part of our ONLY historic commercial interior worthy of protection. We as a community had no way to protect them. Developers come and go. If we don’t regulate them, we’ll have nothing worth saving. Think anyone is going to want to save the CVS building or the Quiktrip? Horton’s? Shop’N’Save? They’re all disposable pieces of architecture. If the only clues you had were those buildings you couldn’t even tell what state you were in. We have some wonderful buildings that are worth protecting. I made a list 10 or 12 years ago. I haven’t updated it in awhile which can be depressing because of what we’ve lost since then. I can send it as a pdf to anyone interested. If you look around town there are folks that are turning some difficult buildings around. Rob Birenbaum is a commercial property owner you can trust. So is Patrick Jugo. I can’t remember having any problem with any of the buildings these guys have been involved with. Penzey’s, Foundation Grounds, the Greenwood Historic District and others are all great assets to our commercial district. David Schlafly who owns the Cape-Harper building, where the magnificent cabinetry was once located, has done some amazing and difficult restorations not the least of which is the Cape-Harper building itself. I regret that his fine record has to bear this stain. I think it’s important to keep attention on this incident of historical vandalism. Hopefully it will influence others to realize what they collectively “own” in their communities that are irreplaceable. Happy New Year to you as well, Nora. Harper’s Pharmacy was an elegant store. The historic photographs were actually courtesy of tw0 descendants in the Harper family, Alice Harper and Mary Harper Hall. Much thanks for your comment. Very enjoyable, memorable…but none the less sad to see. 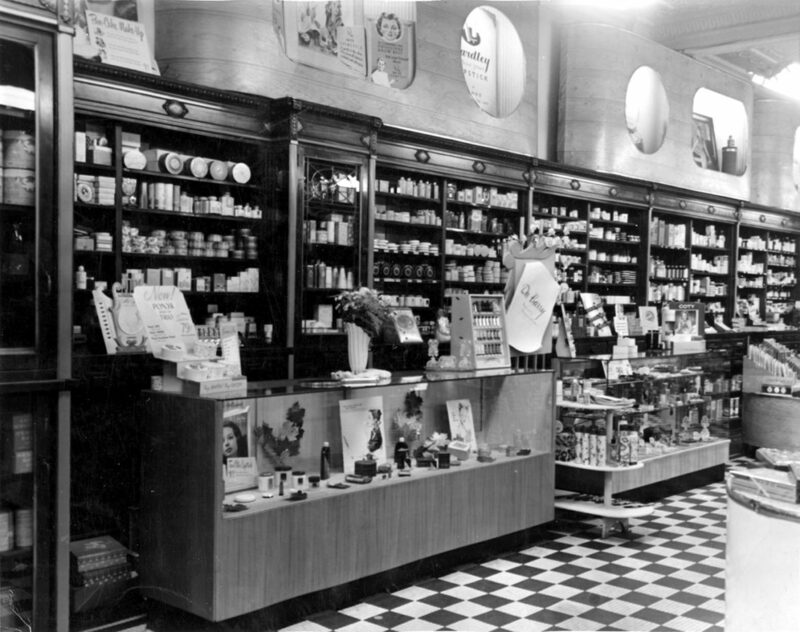 Harper’s was one of the finest drug stores around, and it was once a favorite haunt of Harry Babbitt who in 1934 became a radio announcer on KWK, then went on to singing fame with the Kay Kyser Orchestra.